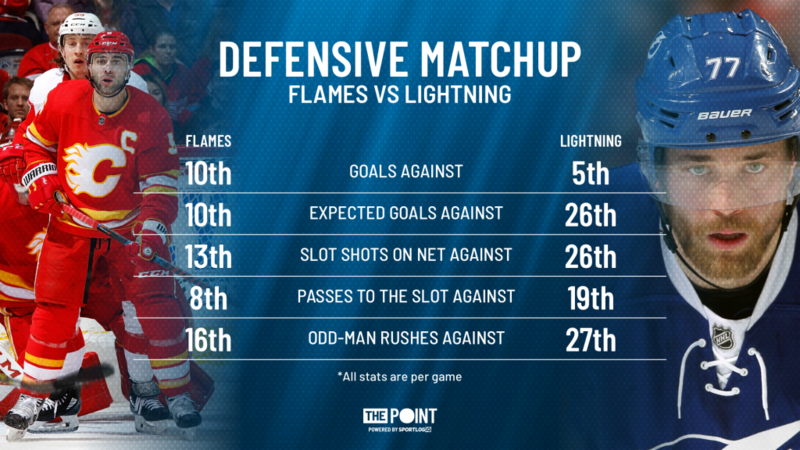 Flames vs Lightning: A Battle of the League's Two Best Teams - The Point Data-driven hockey storytelling that gets right to the point. Tonight, the two best teams in hockey collide in a potential Stanley Cup Finals preview. The Lightning have a double-digit lead in points on second place and have been on top of our Power Rankings for the last nine weeks, completely owning the Eastern Conference’s top seed. Calgary, meanwhile, is just one point behind the Sharks for the top spot in the West with two games in hand and have monopolized second place in our Power Rankings for the last six weeks. 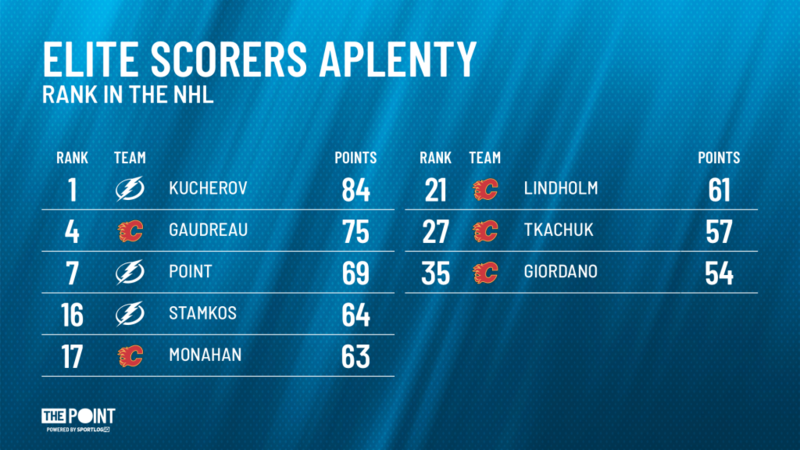 The Lightning and Flames also rank 1st and 3rd in goals per game respectively and have, between them, eight of the league’s 35 best scorers. So, we know these teams can fill the net, there’s no doubting that. Which means, defense and goaltending will be the key to tonight’s matchup. Let’s start with the defensive breakdown. Tampa may have the edge in the all-important goals against category, but they’re fundamentally a high-event team. They create a lot, but they give up nearly as much on the other side, relying on elite goaltending to keep pucks out of the net. For comparison, Tampa gives up 15.7 slot shots on net per game, the exact same as the Ottawa Senators, who rank dead last in goals against. Calgary’s defense, meanwhile, inspires much more confidence. Led by Norris candidate (and favourite if you ask me) Mark Giordano, the Flames’ defense grades as a fringe top-10 unit in most of our key defensive categories. They do a much better job limiting access to the middle of the ice than Tampa. With a couple of high-powered attacks going head to head, Calgary’s defense looks better equipped to survive tonight than the Lightning, but Tampa’s not so secret defensive weapon is between the pipes. Vasilevskiy’s actual to expected goals mark ranks 1st among starters this season, and second to only Laurent Brossoit overall. He saves his team nearly one goal per game compared to league-average goaltending, an impressive feat considering the volume of shots that come his way on a nightly basis. His save percentage from the slot and inner slot also both rank in the league’s top 10. David Rittich doesn’t have the name recognition like his counterpart, but his first full-time NHL season could harldy have gone any better. He started off behind veteran Mike Smith but quickly wrestled the starting job away from him and hasn’t looked back since. 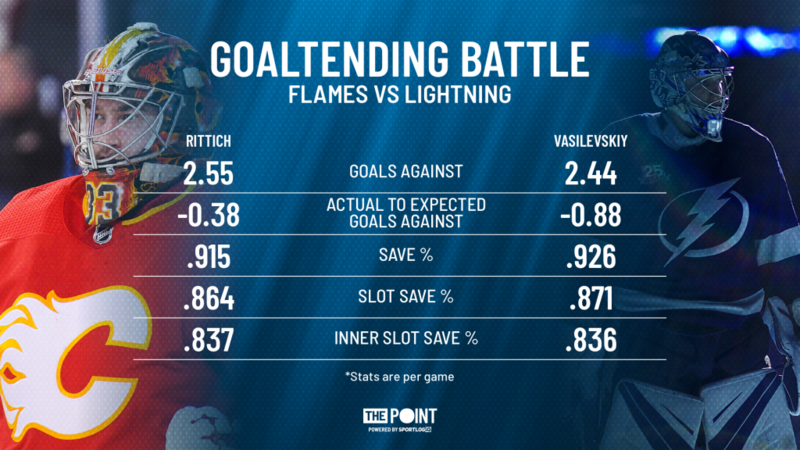 Rittich ranks top-10 league-wide in save percentage, goals against average and wins and has been a key part of the Flames’ best season in years. Tonight’s game might be only worth two points on paper, but in reality, it’s much more than that. Tampa won the first matchup in December, squeaking by for a 5-4 win in shootout. 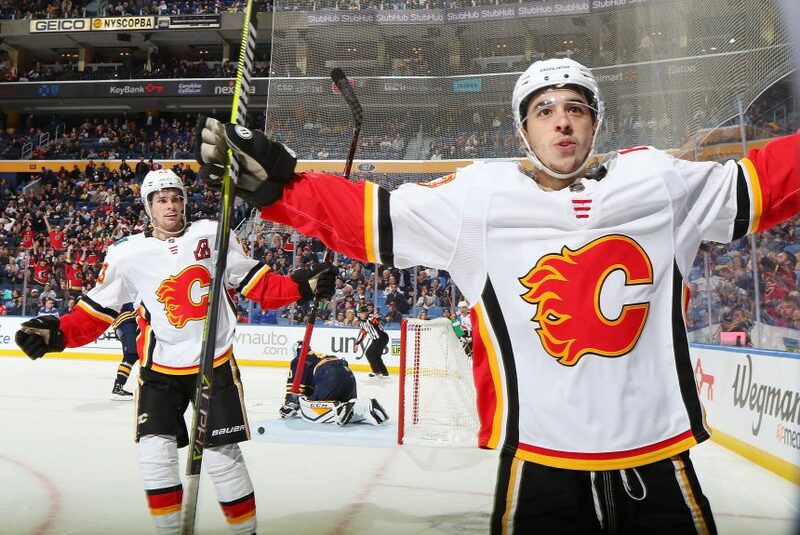 Calgary will be eager to prove they belong in the conversation with the league’s best team and a win against the Lightning would go a long way towards that. One thing is certain – tonight’s game has all the markings of a highly entertaining game.